I don’t like winter. At all. I don’t like being cold and I don’t like snow. January through March is the worst. The holidays have passed and the decorations are down. Everything seems to plain and so drab. 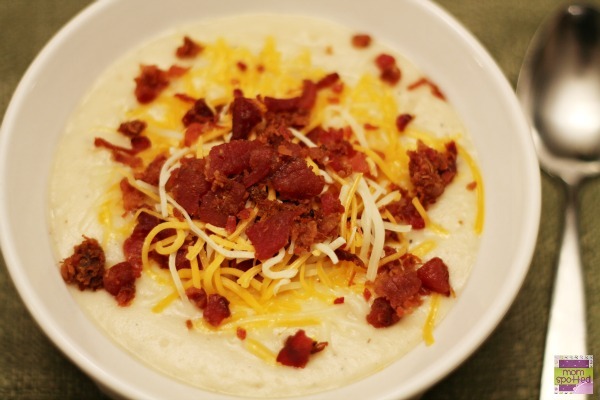 At least, there are comfort foods and a crock pot to make recipes like this Loaded Potato Soup, right? I really like when I can toss a few ingredients in my crockpot and let it simmer all day and have dinner ready hours later with minimal effort. 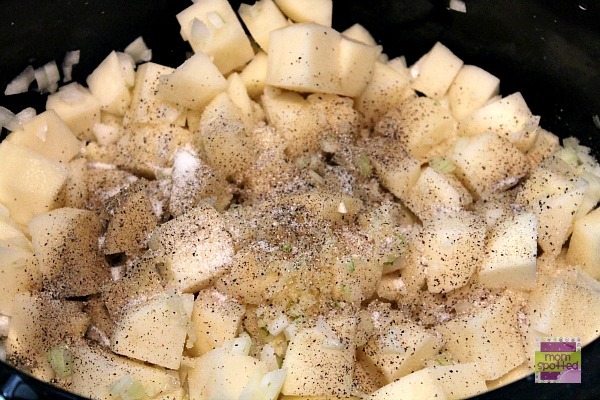 One hearty comfort crockpot meal I love is Potato Soup and I was mad when I realized I lost my favorite recipe. I was determined to put one together and this one is even better than before! 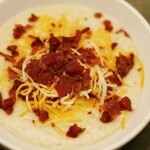 Here’s how I make our Loaded Potato Soup now. First peel and cube potatoes into small cubes. Roughly one inch. 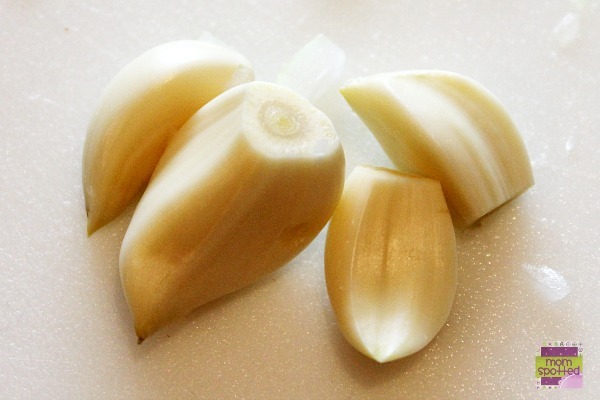 Place in the crockpot. 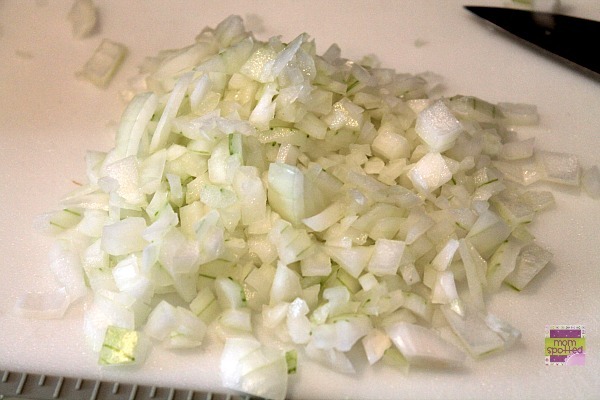 Then chop the onion and add to crockpot. 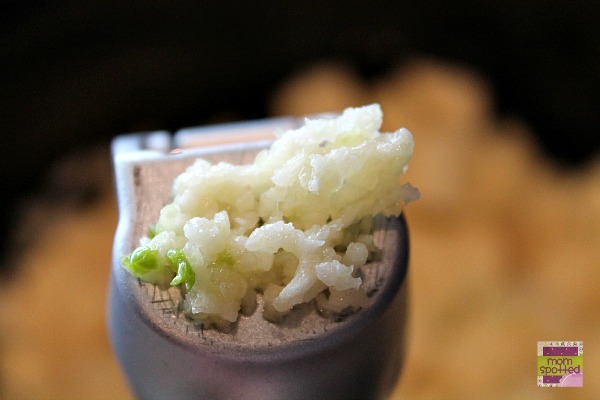 I use a garlic press. If you don’t have one. I’d get one they are great to have. Add in chicken stock and stir. Cook on low for 7 hours. You could speed it up to about 3 hours on low. 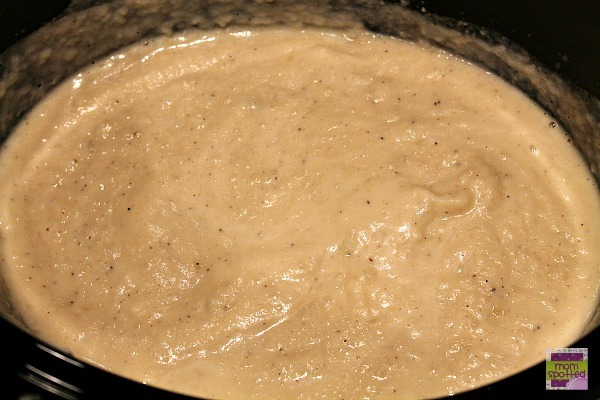 Add in heavy cream and stir. It will look like this after. Take your immersion blender. Or your regular hand blender like I did (just don’t hit your pot) and blend it together. But only for a moment. You still want lumps and you don’t want it puree. Stir. Let sit on low for another half hour. It’s filling so I use smaller bowls. Then top with shredded cheese and bacon crumbles. This soup will come out very hot so be careful as you serve. Especially when serving kids. My boys and especially my husband kept repeating over and over how good this was. Hubby even said this could be one of the yummiest soups. Let me know if you give it a try. 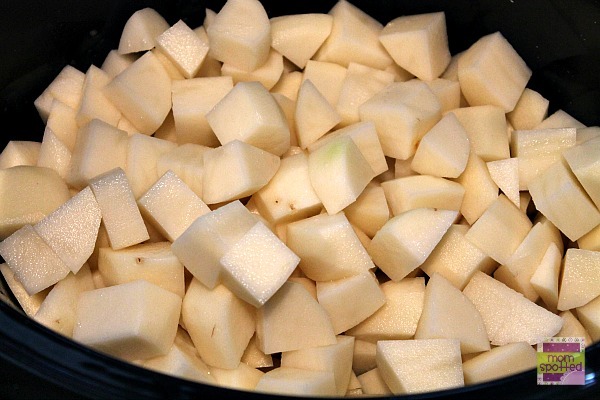 Cut potatoes into one-inch cubes. 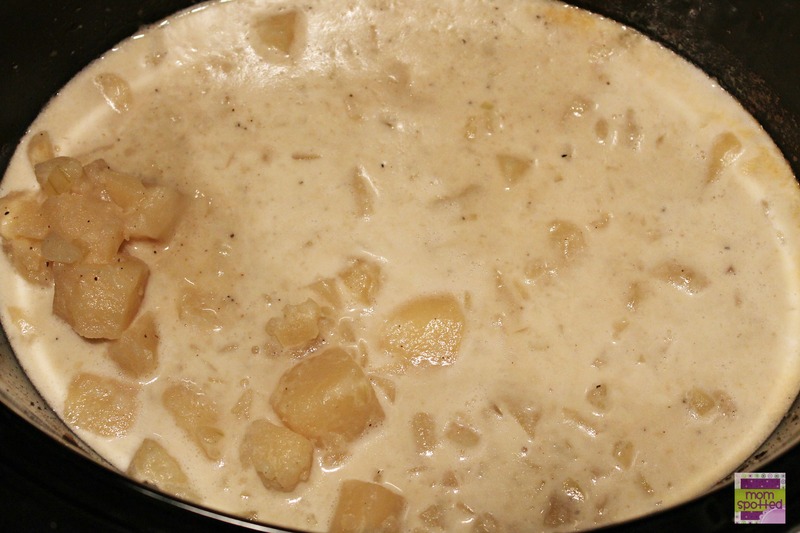 Add all ingredients to slow cooker except heavy cream. Blend mixture with mixer. Leave lumpy. Cook low an additional 30 minutes. Serve with cheese and bacon crumbles. Thanks for this recipe!! I will be making this on Saturday because we are expecting yucky weather and this will be perfect!! I am so glad you shared this! 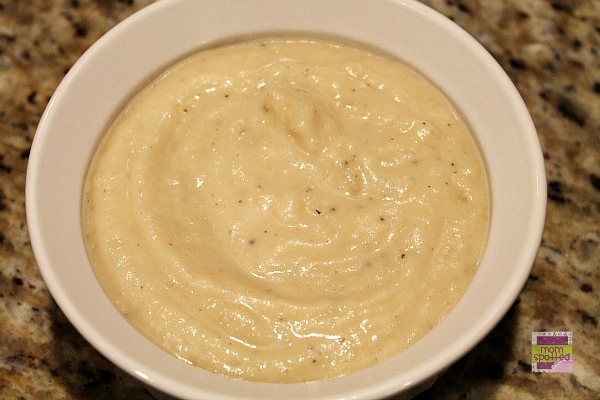 I looked all over Pinterest for a easy/delicious looking/slow cooker potato soup recipe and couldn’t find one. Making this soon! Thank you! Definately need to try this soup! Seems so easy to make and it looks absolutely delicious! Wow, this looks really great and in a slow cooker too. 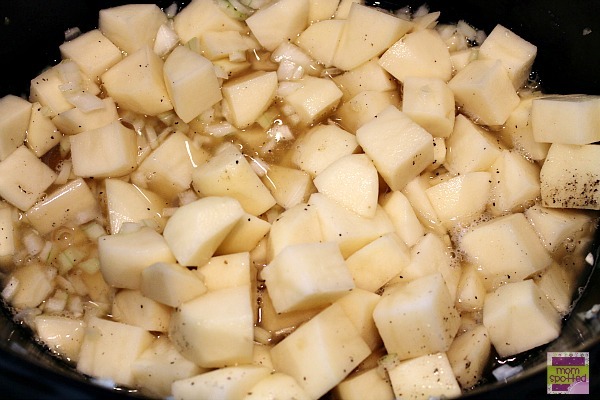 I normally make my potato on top of the stove, I will have to try this recipe. This looks so good!1 I love that its a slow cooker recipie!! Oh, I love potato soup! This looks great…I’m pinning it! Yummy!! Definitely trying this, sounds delicious and easy! Okay, here’s the $50,000 question. How many calories is that is what I wanna know because I lover soup. Any soup. All kinds of soup and nice and hot! This definitely looks yummy and more importantly simple! hehehe Thanks for sharing my friend! wow this looks delicious, I had something similar at outback the other day, but yours looks better! nothing like some good old homemade soup ! your kids probably love it when they’re sick! Super excited to try this, but I made a prep error. I added the cream with everything first. Has anyone done this? Outcomes? Fixes? Do I scrap and start again? 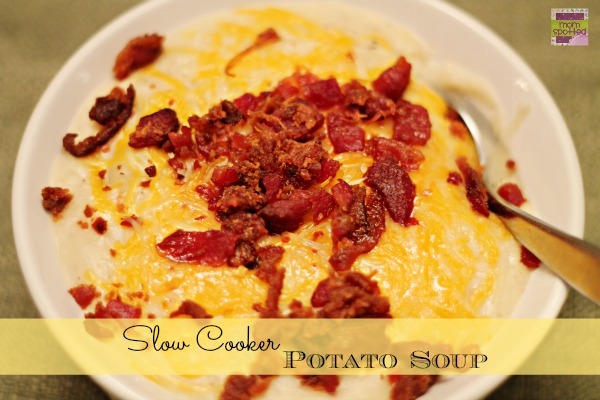 I love our slow cooker and am always looking for new ideas.This looks delicious! What a wonderful recipe. I am a soup fanatic and like to try new soup recipes at least 2-3 times per week. Thank you for sharing this. What a nice easy soup to make. It’s starting to get cooler outside here and it’s time to start making soups. This one sounds perfect and I can’t wait to try it. Yum, this looks so good!! Thanks for sharing! I also hate winter and the cold… So this soup looks so good, it should help. I need to try it. I can’t cook!!! And I made this soup and it is freaking AMAZING!!!!!! And so easy!!!! If I can make this anyone can make it. Best soup I have ever ate! Hands down! I’m so glad you had success! This is my my husband’s and oldest son’s FAVORITE meal too! This recipe was delicious! My children loved it! My picky mother went back for seconds! I only added veggies and meat at the end because my husband complained (he’s a true meat eater). Thanks so much! Will definitely add to our winter meals!! I love any excuse to use my slow cooker. This soup recipe sounds delicious perfect for a chilly Fall day.